This is true variegated, multi-hued, filament silk which has been brilliantly dyed. This is not Jasper thread. 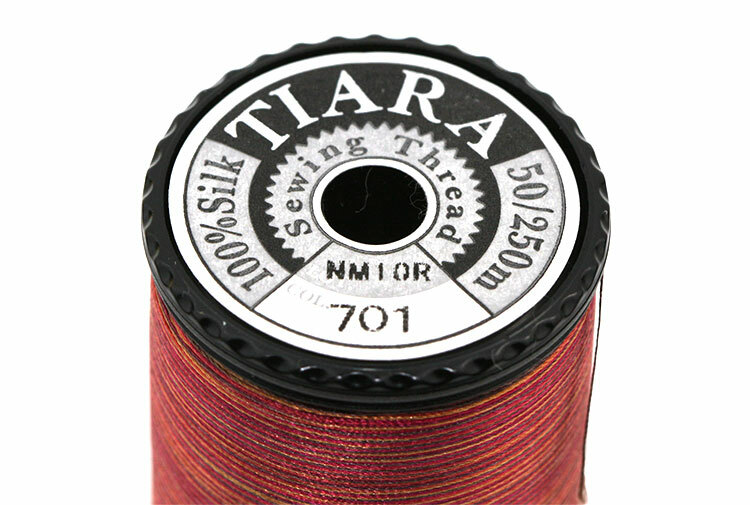 Tiara variegated silk offers the discerning rodmaker the chance to experiment with “space dyed” thread. This is true variegated, multi-hued, filament silk which has been brilliantly dyed. This is not Jasper thread. Jasper threads are created when multiple strands of individually, but differently, colored silks are wound together to create the distinctive ‘twist’ pattern you may recognize from the Pearsall’s Jasper silk or similar vintage silks. Variegated silk is created by the more or less precise application of various mordants to an existing, multi-strand, silk thread which is then immersed in various dye baths. The many dyes react with the several mordants to imbue the length of the thread with a constantly shifting pattern of color. This can be a random color pattern, but in the case of Tiara, this intensive process is closely controlled so that the color patterns hold true from spool to spool, and batch to batch. Minor variability is of course to be expected and embraced. There are 24 multi-hued options, eight each in three categories; 250 meters/spool; size #50. I will attempt to give a brief description of the colors in each category, but in every case there is so much more than what I can mention. Be forewarned, these are my impressions of the colors at a distance of several feet, not official color names. Pay close attention to the color sample photos. Better yet, invest in the Tiara color “book” and you’ll have physical samples of every option at your fingertips. “Gradation” offers eight basic colors, each patterned with an array of lights, darks, and very subtle contrasts. Roughly speaking, you’ll discover these colors (501 – 508) to be Yellow, Orange, Red, Purple, Bright Blue, Green, Russet, & Steel Blue. “Light Multi” offers lighter, or brighter, color patterns (601 – 608) assembled around the following color groups: Orange/Yellow/Red, Red/Pink, Yellow/Green, Green/Blue, Purple/Blue, Mauve/Yellow, Purple/Orange, & Deep Violet/White. “Dark Multi” offers darker, deeper, color patterns (701 – 708) assembled around the following color groups: Claret/Violet, Olive/Violet, Teal Blue/Gray, Purple/Royal Blue, Purple/Gray, Blue/Gray, Orange/Gray, & Blue/Red.